Since the conception of OH LOVE, I have been dreaming about this moment. I have been planning and saving up for this since day one. A little way of paying forward the kindness I received from C years ago (read story HERE). I knew I was coming full circle the moment I stepped into the gates of Children's Joy. Picking Children's Joy as beneficiary wasn't so hard. I came to know them when my sister D gave away Christmas gifts there some years ago. 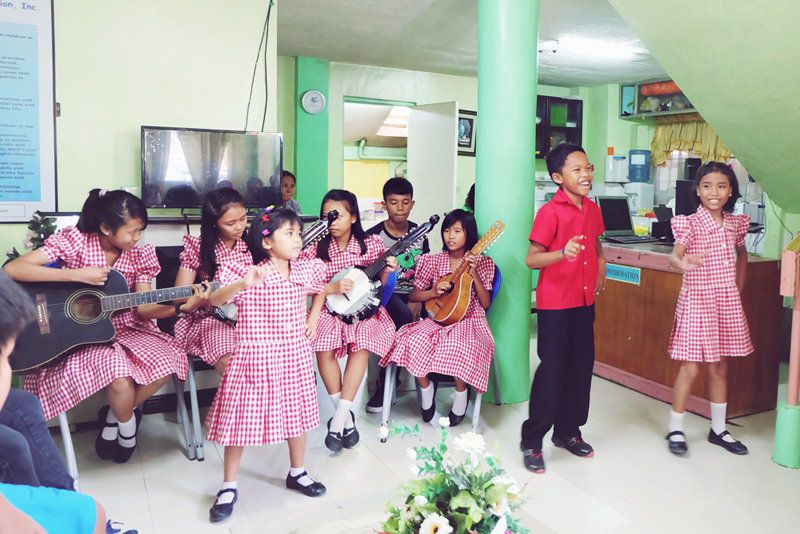 I like that this foundation is not only supporting the education of abandoned children, they are also teaching them music. That day, we gave away 35 pairs of shoes and 55 packs of school supplies. This foundation is supporting 53 kids both in-house and community school children. I am extremely grateful to everyone who has ever bought OH LOVE shoes because their purchase has contributed to this cause. I am also incredibly grateful to all those who donated time and money. They all made this possible! If you are one of them and is reading this -- THANK YOU! They always have some kind of musical presentation whenever benefactors/donors visit. These are the in-house kids. Some of them were out of the camera's frame (they were seated at the staircase). The rest of the beneficiaries, the community kids, were at church when we visited. Photo 1: Although they misspelled my family name, I posed here because I was told the kids made an effort to cut out those letters. Photo 2: After their presentation (they sang about three songs), the kids all sat down at the staircase while my nephews and niece serenaded them. We posed for a quick photo with the kids and the center head, Ms. A, to remember this day by. I'm really glad that my family joined me. I wanted my nephews and nieces to see that there's another reality other than the one they know. I was touched to see that they easily made friends with the kids at the foundation. They were teary-eyed when we left. I hope that this experience will make them more grateful and kind and compassionate. This has always been the dream. And even though I've personally come full circle, it is just the beginning for OH LOVE. As it grows, the giving will, too.